Kimberly Sullivan ’13. Photograph by Phyllis Graber Jensen/Bates College. Maine Campus Compact will present Kimberly Sullivan ’13 of Brunswick, Maine, with the 2013 Heart and Soul Award, recognizing exemplary civic engagement. Sullivan, who is being honored for her work as co-founder of Lewiston’s Tree Street Youth Center, is among six students at Maine colleges honored with the Heart and Soul Award. 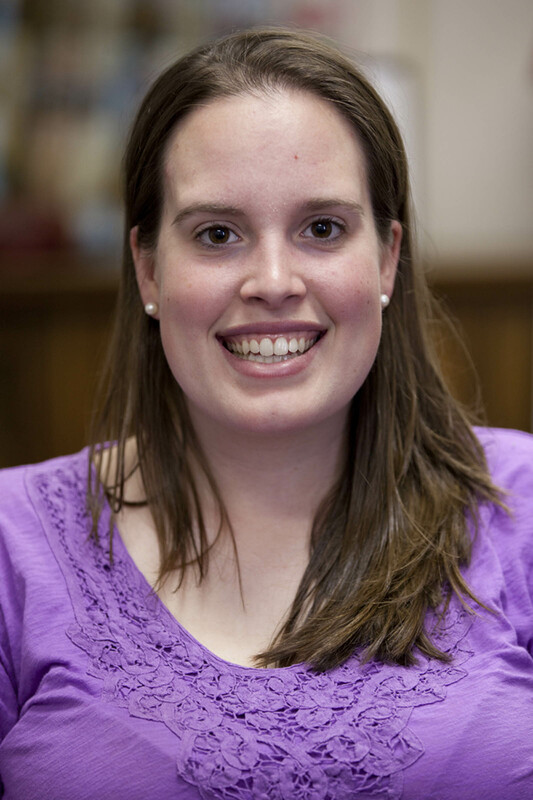 She is also one of two members of the Bates community to receive a 2013 MCC award. The other is Emily Kane, Whitehouse Professor of Sociology, who will receive the Donald Harward Award for Faculty Service-Learning Excellence on the basis of her achievements in linking her teaching to community-engaged research. Sullivan, Kane and the other recipients will receive their awards in an April 30 ceremony in the Hall of Flags at the Maine State House, in Augusta. Learn more about Emily Kane’s work leading to her award. Heart and Soul recipient Sullivan began tutoring local youth at a local after-school program in 2010 after discovering that she needed additional fieldwork hours for a course requirement. But this miscalculation led to a calling, as the tutoring work revealed to Sullivan her passion for working with young people, especially helping them prepare for college. In 2011, after realizing the great need of summer programing for at-risk youth, Sullivan took her passion to the next level. She and Julia Sleeper, a member of Bates’ class of 2008, founded Tree Street Youth Center to fill the gap in summer activities. So named as a way to reclaim the term “Tree Street,” which often had negative connotations of downtown Lewiston neighborhoods, the program started out serving 80 students in second through fifth grade in the mornings, and up to 100 middle and high school students in the afternoons. Now a year-round program, Tree Street provides activities including academic tutoring, enrichment programs in the arts and athletics, and safe-space mentoring — that is, counseling on issues regarding diversity and equality provided within a supportive environment. Sullivan established Tree Street’s College Prep Program for middle and high school students with no family history of higher education. Undertaken in collaboration with local schools, the program includes workshops on the college application process and on applying for financial aid, college visits, one-on-one consultation with students and SAT preparation. For her senior thesis, the capstone of the Bates education, Sullivan undertook a critical assessment of Tree Street programming, based in part on interviews with past participants. After graduating, she will continue to work at Tree Street. She plans to launch a parent “college knowledge” workshop this summer to increase the understanding of the college application process. “Although I looked at and talked with many other college access programs and other potential employers,” she says, “I always knew that my heart was in Tree Street, and in continuing to grow the College Prep Program. Heart and Soul recipients demonstrate innovativeness and flexibility in enhancing campus efforts to address community issues; an ability to lead, inspire and engage other students and members of the institution; and success in integrating their work into the institution’s structure for the long term. The other 2013 recipients are Chloe Beaven, Maine College of Art; Madi Louis, Colby College; Alexandra Pastore, University of Maine; Darla Shenberger, Kaplan University; and Sarah Therrien, University of Maine at Augusta. Maine Campus Compact is a coalition of 18 member campuses whose purpose is to catalyze and lead a movement to reinvigorate the public purposes and civic mission of higher education. Learn more.